Yesterday I went for a run at Greenlake Park in Seattle. It's a beautiful space centered around a lake. There is a beach, a performing arts theatre, a kayak area, a community center and a fairly level path that is typically filled with runners, rollerbladers, moms and dads with strollers, senior citizens and bicyclists. I discovered this special place last year. Yes, we've now lived in Seattle for a few years now (from New England) but I never got a chance to get to know Seattle since I was always on the road for my job at MSN. When things went south in 2009/2010 I decided there was only so much grieving I could do and I needed to get out of the house. Well, to be honest, actually I needed to get out of bed. I believe that exercise helps heal you. So I found Greenlake one day, put one foot in front of the other and walked 1/2 mile then a mile and now depending on the day I'll go at least 2.8 miles around the lake. I know where the ducks like to hang out and when the new moms do yoga together out by the water. I see the same faces and we nod to each other. It feels like a community. You never know what you'll see at Greenlake Park. I love this guy too. 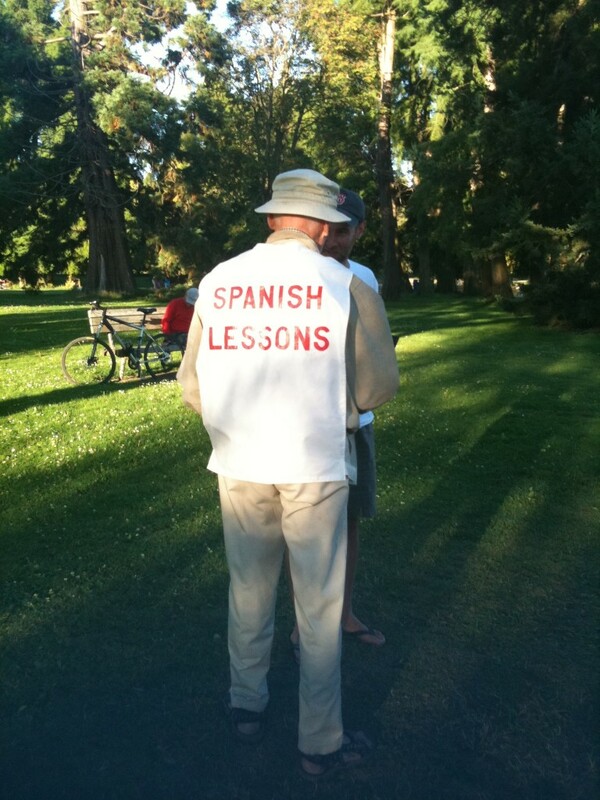 This senior citizen was offering Spanish lessons. When I took this photo, a young guy had just stepped up to take advantage of this cool opportunity. There are the walkers and the runners and the bikes but Greenlake also seems to draw the unique personal transportation inventions like the standing bike or the sort of homemade part skateboard part skates that I saw a guy happily using last week. Yesterday though I saw something that made every single person who walked by smile. I was bummed out when I go to the park yesterday afternoon. I was missing L. who is away on a business trip to NYC and I knew I was going to be bombarded by the strollers at the park which at first make my heart skip a beat, I want one so. (A baby that is. Well, and a stroller too.) I debated going to Greenlake yesterday. I was in Seattle for an early meeting and I really wanted to go home and make macaroni & cheese. I set the GPS for home but then Greenlake tugged at me. The little angel part of me said "A run will make you feel so good." The devil part of me said "Oh, but remember how good mac & cheese tastes when you make it with sour cream? Oh God, so good." Torn. I was torn. I made a deal with myself. I said "If I find a parking space I will run, if not I will go home and make a little bit of heaven." When I pulled in, there it was with angels singing, a parking space right in front of the park. Of course. And then there she was, the dog walker who made 9 dogs supremely happy, so happy in fact that they neglected their natural instincts to lunge in the water after the ducks and geese. I was grateful for her and the dogs for making all of us happy yesterday. I'm laughing in fact as I write this, thinking of the big group of guys (Marines? Hoorah!) running by the dog pack as they all ran past smiling and glancing back over their shoulders. Two packs, similar. You just never know what's around the corner that will make your day. I just heard from the dog walker and her name is Gwen Howell. Hi, Gwen! You're amazing! You truly have a gift with these dogs! I look forward to running into you again!